Jersey suffered their fourth straight defeat of the new season but grabbed their first Championship bonus-point, in a 54-31 loss at Rotherham Titans. The hosts ran in four first-half tries to take a 34-10 half-time lead. Eamonn Sheridan, Carl Kirwan, Pale Nonu and Alex Rieder all touched down with Dai Bishop scoring for the islanders. Tries from Nathan Hannay, Glenn Bryce and Bishop's second kept the score respectable, but Garry Law and Michael Doneghan hit back for the Titans. Law's kicking was exemplary throughout, adding 24 points with the boot. Jersey's first-half defensive display was at the root of the defeat - missed tackles and players out of position left the island side facing an uphill struggle. But they showed resolve at the start of the second period, and for the first 20 minutes penned Rotherham back in their own half. Jersey got the try their pressure deserved when skipper Nathan Hannay went over, but the result never looked in doubt. The impressive Law grabbed his try soon after Hannay's touch down to re-open the gap but Glenn Bryce's try kept alive Jersey's hopes of a first point of the season. Rotherham hit back again when replacement winger Mike Doneghan went over in the corner. But in the closing stages the visitors grabbed the important fourth try after a superb counter from their own 22 set up Bishop for his second of the afternoon. 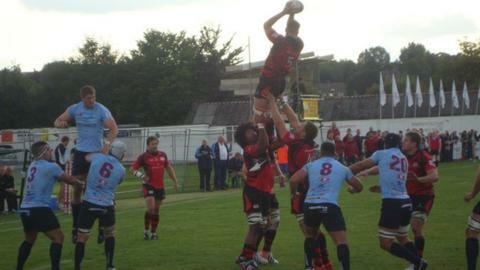 "I thought our mistakes again cost us the game," Hannay told BBC Radio Jersey. "I'm pleased with the boys fight and the ambition to get the fourth try and get us on the board in the Championship . "Coming here, narrow pitch, big forwards, it's very hard to get any points so we'll take one point with the errors that we made. "We could be winning games but we're not because the errors are killing us."